If you do not have enough time to open your mail box to check up new messages, then, this application has been designed for you. 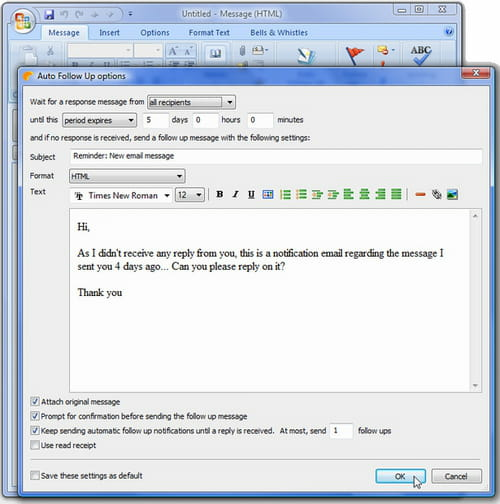 Auto Follow up, designed by DS Development and released in 2010 has been automated to follow up emails on Outlook. One of AutoFollowUp's main features is that it can send follow-up emails from an Outlook email account. You can send these emails to some contacts that failed to respond to your messages. If the contact does not respond to your mail, you can notify yourself using the program. For that, you do not need to send a follow-up email. You can also add follow up alerts for sent email messages. 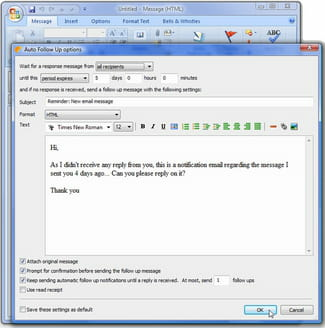 As for the management of follow-up tasks, users have to click on the "Auto Follow Up Outlook toolbar" and then choose "View Follow Ups". Then, you can see all active follow up items and edit or delete them depending on your needs. With its flash tutorial integrated with it, the application helps to manage follow up emails. It explains how to use Auto Follow Up through numbers of sections. Auto Follow up has an intuitive, user-friendly interface. It is a shareware version but you can buy the license for $ 29.95. Latest update on June 7, 2016 at 05:08 AM.